The goal of the IoT Large Scale Pilots (LSP) Programme is to foster the deployment of IoT solutions in Europe, demonstrate their feasibility and benefits and promote the development of a sustainable IoT ecosystem. The projects design and apply IoT approaches to real-life challenges of high relevance, technology readiness and potential socio-economic impact for Europe. 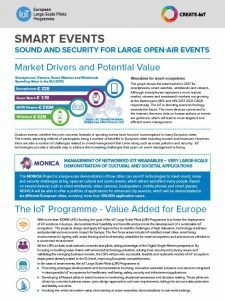 IoT wearables and devices for smart events represent one of the key focus areas in the framework of the IoT LSP Programme. 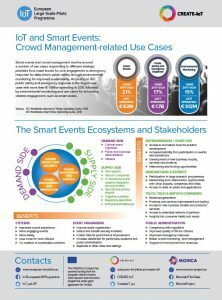 Smart events and crowd management revolve around a number of use cases responding to different strategic priorities from smart kiosks for civic engagement to emergency response for data-driven public safety through environmental monitoring for improved sustainability. According to IDC public safety and emergency response is the largest use case with more than € 1 Billion spending in 2017, followed by environmental monitoring and use cases for enhancing citizens engagement, such as smart kiosks.